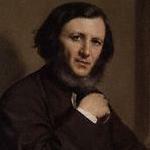 It is generally assumed that Robert Browning was A.S Byatt's poetic inspiration for Randolph Henry Ash. "Its boards were bowed and creaking; it had been maltreated in its own time. Its spine was missing, or rather protuded from amongst the leaves like a bulky marker." Secreted from man's life when hearts beat hard..."
Indeed, the romance between Christabel LaMotte and Randolph Henry Ash is similar to Robert Browning's affair with Julia Wedgewood which was revealed in the late 20th century. The general style of Browning's poetry is echoed by Ash especially Ash's extensive poem 'The Garden of Proserpina'. However, it is important to remember that Byatt's characters are a construct and not any one figure. 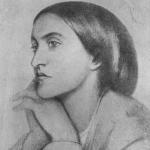 If Ash is a construct of Browning, then Christabel LaMotte is an image of Christina Rossetti. Rossetti's vivid imagery has been extended to the poems of LaMotte. And, her literary connections and famous family are echoes of Christina's involvement in the Pre-Raphaelite Brotherhood. When may was young; ah, pleasant May!" Rossetti's poem 'May' has many connotations within the novel as this was the name of Christabel's child and the premise of the Postscript. "Two people met, on a hot May day, and never later mentioned their meeting. This is how it was." Link to The Goblin Market with illustrations.